China World Fibre Report 2015, Polyester Filament Yarn, Viscose Filament Yarn. In 2014, China produced 47.8 million tons of fibre/filaments, comprising 5.9 million tons of cotton and 41.9 million tons of manmade fibre/filament. In 2014, China alone consumed 47.2 million tons of fibre/filament accounting for 64% of World's textile fibre/filament and 30% of cotton. 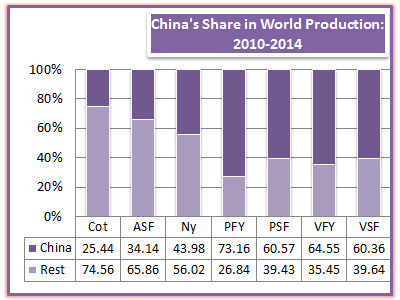 China was the largest importer of acrylic staple fibre, nylon, and cotton.